The example of gravitational attraction that’s probably most familiar to you is your weight, the force that attracts you toward the earth. During his study of the motions of the planets and of the moon, Newton discovered the fundamental character of the gravitational attraction between any two bodies. Along with his three laws of motion, Newton published the law of gravitation in 1687. It may be stated as follows: Every particle of matter in the universe attracts every other particle with a force that is directly proportional to the product of the masses of the particles and inversely proportional to the square of the distance between them. Translating this into an equation, we have F. = Gm,~ (law of gravitation), g rZ (12-1) where Fg is the magnitude of the gravitational force on either particle, m and ~ are their masses, r is the distance between them (Fig. 12-1), and G is a fundamental physical constant called the gravitational constant. The numerical value of G depends on the system of units used. CAUTION~ Because the symbols g and G are almost the same, it’s common to confuse the two gravitational quantities that these symbols represent. Lowercase g is the acceleration due to gravity, which relates the weight w of a body to its mass m: w = mg. The value of g is different at different locations on the earth’s surface and on the surfaces of different planets. By contrast, capital G relates the gravitational force between any two bodies to their masses and the distance between them. We call G a universal constant because it has the same value for any two bodies, no matter where in space they are located. In the next section we’ll see how the values of g and G are related, but remember that they’re two very different quantities Gravitational forces always act along the line joining the two particles, and they form an action-reaction pair. Even when the masses of the particles are different, the two nteraction forces have equal magnitude. The attractive force that your body exerts on the earth has the same magnitude as the force that it exerts on you. When you fall from a diving board into a swimming pool, the entire earth rises up to meet you! (Why don’t you notice this? The earth’s mass is greater than yours by a factor of about is so its acceleration is only lQ-23 as great as yours.) 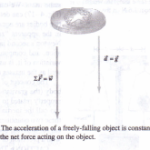 We have stated the law of gravitation in terms of the interaction between two particles. It turns out that the gravitational interaction of any two bodies having spherically symmetric mass distributions (such as solid spheres or spherical shells) is the same as though we concentrated all the mass of each at its center, as in Fig. 12-2. Thus if we model the earth as a spherically symmetric body with mass ~, the force exerted by it on a particle or a spherically symmetric body with mass m, at a distance r between centers, is provided that the body lies outside the earth. A force of the same magnitude is exerted on the earth by the body. (We will prove these statements in Section 12-7.) At points inside the earth the situation is different. 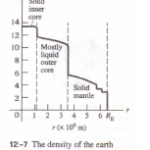 If we could drill a hole to the center of the earth and measure the gravitational force on a body at various depths, we would find that toward the center of the earth the force decreases, rather than increasing as 1/r2• As the body enters the interior of the earth (or other spherical body), some of the earth’s mass is on the side of the body opposite from the center and pulls in the opposite direction. Exactly at the center, the earth’s gravitational force on the body is zero. 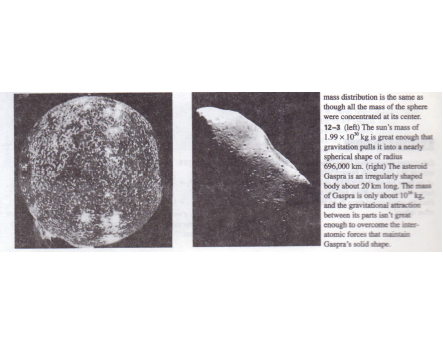 Spherically symmetric bodies are an important case because moons, planets, and stars all tend to be spherical (Fig. 12-3a). Since all particles in a body gravitation ally attract each other, the particles tend to move to minimize the distance between them. As a result, the body naturally tends to assume a spherical shape, just as a lump of clay forms into a sphere if you squeeze it with equal forces on all sides. This effect is greatly reduced in celestial bodies of low mass since the gravitational attraction is less, and these bodies tend not to be spherical (Fig. 12-3b). To three significant figures, G = 6.67 X 10-11N· m2/kg2• Because 1 N = 1 kg- rnIs2, the units of G can also be expressed (in fundamental SI units) as m3/(kg • S2). Gravitational forces combine vectorially. If each of two masses exerts a force on a third, the total force on the third mass is the vector sum of the individual forces of the first two. Example 12-3 makes use of this property, which is often called superposition of forces.